The Orbit Optical Trackball from Kensington offers users an ambidextrous alternative to traditional mice which require a constant grip to be used and a larger amount of space on the desktop. A 40 mm trackball with optical tracking for accuracy is centrally positioned for ease of movement by the fingers. Left and Right buttons are located adjacent to the ball, with the thumb and pinkie fingers naturally dropping into position over them. The Orbit Optical Trackball is sized to best fit the needs of small to average sized hands. Users with larger hands may wish to consider one of the larger trackball options. Note: Users who perform large amounts of scrolling need to be aware that the Orbit Optical Trackball does NOT have a mechanism to perform vertical scrolling. These users should consider a trackball which includes a dedicated scroll wheel or ring such as the Orbit Optical Trackball with Scroll Ring. The Orbit Trackball with Scroll Ring from Kensington is an ambidextrous alternative to traditional mice which require a constant grip to be used and a larger amount of space on the desktop. The 40 mm trackball features optical tracking for accuracy and is centrally positioned for ease of movement by the fingers. Left and Right buttons are located adjacent to the ball, with the thumb and pinkie fingers naturally dropping into position over them. The convenient Scroll Ring surrounds the base of the trackball and provides fingertip control of scrolling, from line-by-line to speeding through pages. The optional TrackballWorks programming software permits customization or reassignment of the buttons and offers advanced scrolling control options. The Orbit Trackball with Scroll Ring is sized to best fit the needs of small to average sized hands. Users with larger hands may wish to consider one of the larger trackball options. 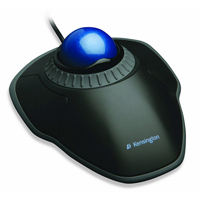 The Expert Mouse Wired Trackball from Kensington is a well-established and proven mousing solution. The large lightweight 55 mm ball features a silky, smooth movement that offers sufficient resistance without straining the fingers. This smooth movement, combined with Diamond Eye optical technology, ensures precision level cursor control is available for gaming, photo editing, or everyday work. 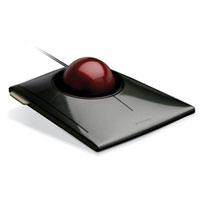 The Expert Mouse Wired Trackball also features a ScrollRing around the base of the ball, giving users easy access to quick scrolling whenever necessary. Basic mouse click functions are plug-and-play but users also have the option of installing the TrackballWorks software for total customization of the 4 large buttons surrounding the ball. Custom and program-specific commands and macros can be programmed for easy completion without the hand leaving the trackball. The ambidextrous design easily accommodates both right and left-handed use and includes a detachable rest to aid users in maintaining a more ergonomic neutral wrist alignment. Users who prefer a wireless device may wish to consider the Expert Mouse Wireless and Bluetooth Trackball which offers all of the same functionality as the Expert Mouse Optical but with the addition of both Bluetooth and standard 2.4 Ghz wireless freedom. The Expert Mouse Wired Trackball will fit most hands. However, if a user has a small hand they may wish to consider the Orbit Trackball with Scroll Ring which features a smaller 40 mm trackball and is better suited for smaller hands. 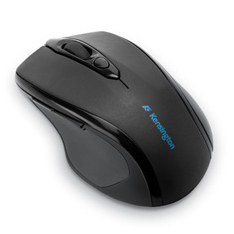 The Pro Fit Full Size Mouse from Kensington is a contoured mouse for right-handed users. This durable USB mouse requires no drivers and comes with a PS/2 adapter. DPI settings can be changed using the switch behind the scroll wheel. Wired and wireless models are available. 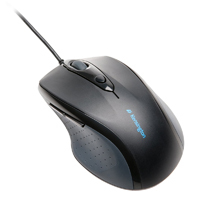 Kensington has taken their venerable Expert Mouse Optical to a new level with the new Expert Mouse Wireless Trackball. 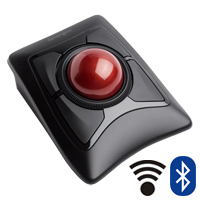 Longtime or novice trackball users now have the freedom of wireless available in a full-size trackball with the additional option of selecting whether to connect via Bluetooth 4.0 LE or traditional 2.4 GHZ wireless using a USB nano receiver. This unique dual-connection feature makes the Expert Mouse Wireless Trackball a good choice for those with a limited number of USB ports or who wish to use the trackball on multiple systems, employing Bluetooth on one and using the RF Receiver on a second or non-Bluetooth compatible system. The Expert Mouse Wireless Trackball employs Diamond Eye optical technology for smooth, precise tracking and features the well-known Kensington Scroll Ring for quick scroll access on web pages and within lengthy documents. Four large buttons provide easy access to primary functions and can be easily customized to personal preferences through the Kensington TrackballWorks software. The ambidextrous design easily accommodates both right and left-handed use and includes a detachable rest to aid users in maintaining a more ergonomic neutral wrist alignment. The body of the Pro Fit Wireless Full-Size Mouse from Kensington is contoured for right-handed use and is large enough to provide support and comfort to larger hands. The driver-free Wireless mouse relies on the common 2.4GHz wireless technology (USB only) and works well in all office settings. The Pointer Speed Quick-Select button enables users to quickly switch between 800 and 1200 DPI settings and the back/forward thumb buttons enable rapid navigation within your web browser. 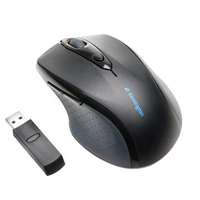 The Pro Fit Medium Size Mouse from Kensington is a contoured, medium-sized, right-handed mouse that requires no drivers (works plug-and-play), is native USB with PS/2 adapter, and is durable (safe for drops and spills) for long-lasting comfort. Wired and wireless models are available. 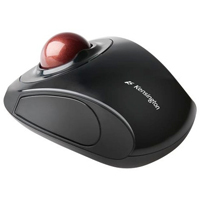 The Slimblade Wired Media Control Trackball from Kensington is designed to provide specialized functionality to those working with audio, video, or image editing. Three modes of operation can be accessed. The Slimblade defaults to View mode which offers traditional cursor control and scrolling function; however, Media and View modes can be easily accessed with a single click. The Media mode provides users with quick access to play/pause, stop, and track forward/backward functions while the View mode offers zoom and pan options. A heads-up display on the monitor advises users as to which application is active and what function is being performed. 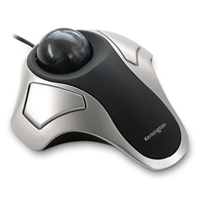 The Slimblade departs from other Kensington trackball designs by employing a 55 mm trackball which is noticeably heavier for its dimensions than other models. 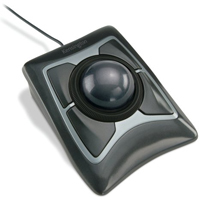 In order to accommodate the need to grip and rotate the ball to accomplish common tasks such as vertical scrolling, 80% of the trackball projects above the housing height, resting freely on top of the trackball base. Note: While providing users with a stylish look and generous functionality, the Slimblade Media Control Trackball does require repetitive pinching and twisting actions to perform common tasks. As well, the increased elevation of the trackball above the housing can lead to significantly greater wrist extension than other trackball designs. These types of actions and hand placement are often considered potential contributors to the development of complaints such as carpal tunnel or other RSI. Users may wish to consider the intended usage and the degree to which these actions may be required along with any realized benefits when selecting a suitable device. The Orbit Wireless Mobile Trackball from Kensington is a compact ambidextrous trackball mouse that provides the convenience of wireless in a small footprint. The compact size and wireless convenience make it a suitable solution for short-term mobile usage or for users with small hands who may find other trackball options to be a bit large. The Orbit Wireless Mobile Trackball is plug and play (no driver required). Buttons situated on the outer sides of the trackball housing provide access to Left and Right Clicks. Scrolling is available via dual Touch Scroll Zones that are positioned to the left and right of the compact 32 mm trackball. Functions also be customized by installing and running the TrackballWorks software from Kensington. TrackballWorks offers button customization as well as cursor and scrolling speed adjustment options. In order to extend battery life the wireless range is limited to 10 feet. Users are notified of necessary battery replacement by a low battery indicator light. A power switch further reduces unnecessary battery consumption. In step with the mobile focus of this product, the micro receiver can be conveniently housed in the body of the mouse during travel or storage. 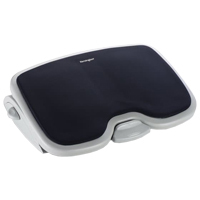 The SoleMate Comfort Footrest from Kensington features a half-inch thick memory foam pad to absorb shock and ease the strain on tired feet. The SoleMate is height adjustable from 3.5" to 5" and offers an adjustable tilt range from 0° - 18°. The innovative foot-activated lock system enables users to adjust and lock the tilt at any point within the adjustment range without needing to leave their chair. Height is adjustable manually via hand. Note: Due to the nature of this product there is no 30 day CSG.